To say it was wet outside on Friday 9th November in Belfast is probably an understatement. I’m pretty sure a fish hit me in the face at one point walking to what is becoming our new home in Ormeau baths. With a wee bit of fancy lighting we really got the place looking on point for our 8th outing of Hustle. And it was a stormer of a night. We were honoured to have two incredible speakers throw down two very different challenges. Marie Lu Vinh, a designer at Idean in London gave us a thought provoking talk on 5 things designers could learn from developers’ ways of working. Should we be supporting our design files with Readme’s and working with Git repo’s to version manage our design files? The challenge was thrown down and many gladly accepted. Marie rightly made us realise that we as designers are lagging behind our developer colleagues in the rigor of our processes, but introduced us to some new tools to start playing catch up. It was a deeply insightful talk with a lot of takeaways. Next came Hugo, a Brazilian designers currently working at Hubspot in Berlin. Hugo had just one question; Are you happy? Hugo wanted to know are you designing happiness into your work? Is it making you happy? Hugo walks us through some examples of organisations and apps that are delivering happiness, with a deep dive into the psychology of happiness. On a night like that, we all needed to feel the hope of happiness, and know it was within us all to make what we do a source of joy. Thank you to all who joined us on the night, through the wind and rain (and flying fish). Be sure to shout out your experience and tag us on twitter @hustle_conf. Hustle will be back in 2019. Thanks to Deloitte Digital for sponsorship as ever. Thanks to Belfast Design Week for support. Marie is a designer interested in the implication of design and technology on life, and how they meet to create the future. She creates human experiences, and helps businesses solve complex problems through trans-disciplinary practices. In particular she is passionate about what design practices can learn from their technical counterparts, and how both sides can work better together day-to-day. Hugo is a Product Designer working for HubSpot - a marketing, sales and services platform. He has been working in the web and design industry for the past 15 years. After studying Web Design Communication in Brazil, Hugo moved to Ireland where he worked with different agencies, airlines and software companies. From email marketing to website and product design - Hugo, has helped companies to build and foster a design culture within the organization. Currently living in Berlin, Hugo is focused on building and growing HubSpot's product and sharing his knowledge through talks and discussions with other Designers and Makers. Firmly believing that ideas really can change the world, Lisa helps organisations consider the bigger picture by using human-centred design to focus on creating experiences that try to make the world a better place. Lisa’s on a mission to make design accessible and practical, pulling back the curtains to demystify the process without losing that special bit of magic that comes from a truly well-designed interaction. Brendan’s career in design spans government, fashion, education, finance, and technology as well as Australia, Europe, and North America. For almost a decade he has led projects inside companies such as InVision, Twitter, GE, Isobar, and many more. As a designer at InVision he looks for new ways for people work inside product organisations and how new tools and methods can create a more impactful design process. Rachel Hood is User Experience Designer at ZOO Digital. Rachel will be sharing her experiences helping organisations consider how important UX is and how it really can make a positive difference. "UX is not a nice-to-have, it's a necessity"
She will be giving us an insight into her design process working with KBC and collaborating with Fintech partners to make sure user experience is always at the forefront and how critical it is to product success. Speaker announcement: Jamie Neely, Monotype. "Type can often make or break a brand, product or service. Join Jamie Neely to learn ways of spotting good type for many different situations. See examples of good type in the wild and learn more about how font discovery and licensing are shifting with the designer in mind." Super excited to have Jamie join us at Hustle so make sure you secure your spot via our Meetup page. This June saw Peter Hughes join us from Canada to share a few pearls of wisdom, and common challenges from across the pond. It was refreshing to meet a senior business leader with a passion for user experience and a respect for the impact of great design. He told us how these passions have led him to "tell it like it is" on more than one occasion, whilst convincing clients and their incumbent business process to believe in the designer. The full video of peters talk is available on our Twitter feed via Periscope. Hustle is back in June to the backdrop of an incredible week of inspiration and learning. We have managed to grab the head of Deloitte Digital in Toronto, Peter Hughes before he speaks at Digital DNA, to come speak to us at Hustle. Get a read of his profile below, he knows his stuff when it comes to bringing truly great experience to real-world digital products. Grab your ticket now! Peter leads the Deloitte Digital Studio in Canada. Based in Toronto, Peter has worked and lived in Australia, New Zealand, Chile and the United States. Peter specializes user experience design, responsive web and native mobile app development. Peter has a portfolio of well over 30 websites and mobile apps for some of the biggest brands in grocery, retail banking, insurance and telecom including: Loblaws (Canada, grocery), Cencosud Paris (Chile, Retail), EQ Bank (Canada, Banking), Sonnet (Canada, Online Insurance), Telstra (Australia, Telecom) and TD Bank (Canada, Banking). In addition to building beautiful digital, Peter spends a lot of time advising executives on how to make their organization a ‘digital first’ culture. His perspectives were recently published in a widely read an acclaimed paper entitled: The Rise of the Chief Digital Officer. In the paper, Peter explores how rapidly evolving digital technologies continue to alter the business landscape with explicit guidance on how to shape a role that stewards digital channels and how that role can complement existing executives, particularly the CIO and CMO. Hustle was created to give local designers a wider perspective on what is going on in our industry. Whether that is about what tools are being used, processes adopted, mentality of work, or just how to do great design work. On our third outing at Hustle, we really checked the boxes. Chris and Duncan both come from very different design houses in Edinburgh, doing very different kinds of work. One, working in-house for a Fantasy Sports company, the other, an agency working across the sectors, but with a charitable focus. Founded in Edinburgh with its HQ in New York, Fanduel is slowly taking over the world with it’s unique proposition and digital roots. Hearing Chris’s story was an insight into the learnings of a large in-house design team, constantly looking for ways to improve their processes and deliver a better product for their customers. Interestingly, Chris talked a lot about what they had done wrong. And in the spirit of Agile attested to failing often. But this wasn’t the message he was trying to beat on his drum. His message was to avoid failure as much as possible by good preparation and learning from others (such as the Google Ventures team and Spotify). But Chris’s main message was about inclusivity, hearing about how Fanduel have started using Design Sprints to solve new problems, and the inclusivity challenge that brings to the table. And whilst they have run a few now and they achieve great results, they are still tinkering with the recipe to really make them inclusive from start to finish. 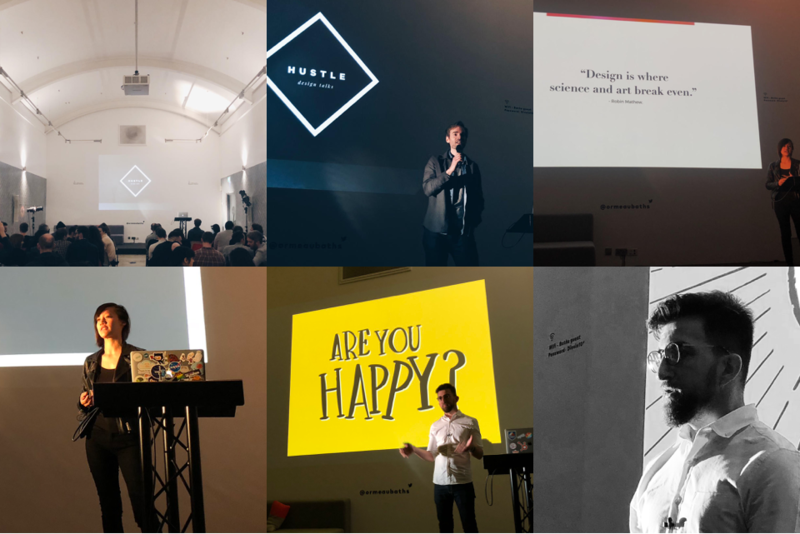 After a short break and visit to the bar, Duncan gave us a fascinating insight into doing design for good, bringing humour and insight to what could have been a sobering talk. Working at Whitespace in Edinburgh, Duncan confesses he has been fortunate to have worked with some inspiring not-for-profit organisations, and witness first hand the good they are doing in places such as Nairobi. But he also inspired us to think about our own goals, because it was actually by design that he wanted to use his skills to help make a positive impact in the world. Not only was Duncan’s work inspiring too, but the integrity with which Whitespace operates to challenge their charitable clients to help themselves, gave a full picture of what it takes to make that positive change. Duncan introduced us to Mary's Meals, Republic of you.org (coming soon), Jennifer Daniels argument that design is capitalism, and Mike Monteiro's theory that design is destroying the world. Superbly thought provoking and insanely inspiring. So a huge thanks to Chris and Duncan for skipping across the Irish sea to fill us up with shared knowledge and inspiration by the haggis-full. (Had to have some Scottish reference). The feedback from everyone has been incredible and we hope to see them back on the Hustle stage in the future.